Every once in a while I stumble across an obscure historical by way that makes me wonder just how different the world might have been if only events had come together just a little bit differently. In the 1930s, the Hindenburg and other zeppelin type air ships established regular transatlantic passenger flights between Europe and the United States. Much faster than any ocean liner, they promised to erase the distance between the two continents and make air travel common place. Unfortunately a few air crashes, particularly the infamous Hindenburg Disaster, turned people off of the idea of traveling in flying death traps and the so the age of the dirigible came to an end. Transatlantic air travel between Europe and America did not start up again until after World War 2, when aircraft were developed that had the sufficient range to make the crossing. But what if the age of zeppelin air travel had started not in the 1920s and 30s but in the 1860s, during the American Civil War. Would we have seen fleets of commercial transport zeppelins ferrying passengers and supplies across the Atlantic? Would the North and the South have developed fleets of dirigible bombers, such as were fielded during World War 1 by Germany? Few people realize just how close this alternate history came to being reality. In 1864, Dr. Solomon Andrew, an American inventor, politician and medical doctor, built an 80 foot dirigible filled with hydrogen gas. Lacking an engine, the machine propelled itself by releasing gas and by undulating like an eel. Dr. Andrew offered his machine, which he called the Aereon, to the Union. A demonstration was arranged on the grounds of the Smithsonian for government officials. 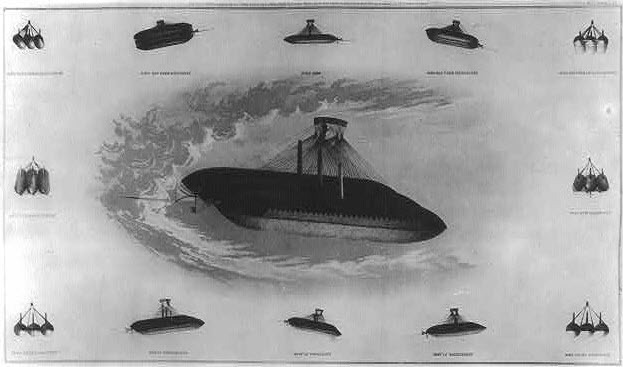 The uses for Andrew’s dirigible were obvious: it could have been used to observe enemy movements, to spot artillery, or even as a bomber. But unfortunately, the army officials who witnessed the demonstration were not able to think outside the box. Their military strategy revolved around cannons, muskets and cavalry; there was no place for innovative flying machines. And so the United States government told Dr. Andrew that it had no interest in the Aereon. Not to be deterred, Dr. Andrew built the Aereon 2, after the American Civil War. He founded the Aerial Navigation Company and planned to set up a regular passenger service between New York and Philadelphia. The Aereon 2 successfully completed two manned flight above New York City in 1866. All seemed set for a new era in travel; the two continents would be only days or hours away. But unfortunately the financial crisis that followed the Civil War meant that there were no investors to be found; and the collapse of the financial system wiped out Dr. Andrew’s company. The Aeron 2 never flew again. And so we will never know what the future would have been like if this amazing machine had been allowed to live up to its potential. The Aeron used a very unorthodox propulsion system, relying on on undulating motions in its fuselage to propel it forward like a wave or eel. But it could have worked: Some of his ideas have been updated and incorporated into the concept of a hyperblimp, which slips through the air. As far fetched as the idea of commercial air travel starting in the 1860s may seem, Andrew was not a mere dreamer. He was a successful inventor with many useful inventions to his credit, including a system for re-keying locks and a padlock which has been used used since 1842 by the U.S. Postal Service. It is likely that the introduction of practical passenger air travel would have had a profound impact on our world, and would have completely changed our timeline. In today’s world air travel has become common place, linking the most remote parts of the world together. Imagine what it would have meant to our society if the effects of air travel which we see today, such as globalization, the growth of a global society, had started almost 90 years earlier. Where would our world be today? It makes me wonder, too, just how many other missed opportunities are out there, forgotten by history. Illustration of the fire that destroyed most of Chicago in 1871. The Great Chicago Fire destroyed most of the Chicago in the space of just under 3 days. It started some time on Sunday October 8, 1871 and raged until early Tuesday, October 10, 1871. 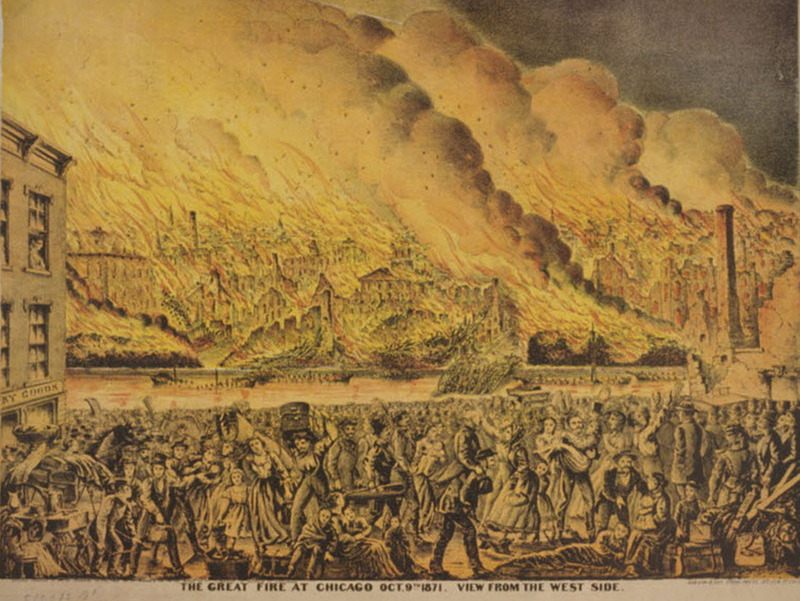 An ill prepared response to the fire allowed it to consume nearly 3.3 square miles of the city, killed over 300 people and rendered over 100,000 people homeless. The Chicago fire remains one of the single worst disasters in American history. According to popular history the fire was caused when Mrs. O’Leary’s cow kicked over a lantern and set fire to the barn. 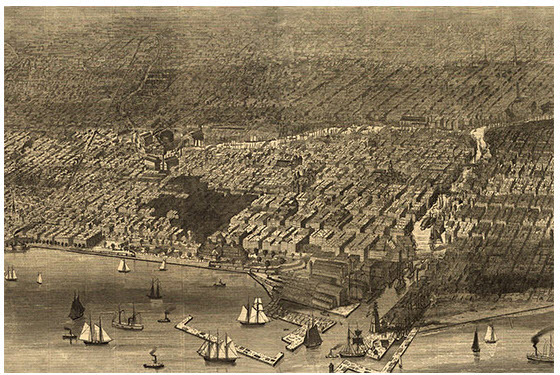 In those days it was not unusual for cities to have a blend of agricultural and residential neighborhoods within their boundaries, and Chicago was no different, so it is not implausible that a cow might have been the culprit. However, a reporter later admitted that he had made the story up. In addition, pinning responsibility on a woman with an obviously Irish, and therefore Catholic, last name played into public mistrust and xenophobia against Irish Catholics. In fact, while one fire did start in a shed near Mrs. O’Leary’s barn, several other fires started throughout the city at the same time. Interestingly, other great fires erupted in the region at the same time, leading some to speculate that the Great Chicago Fire was caused by a meteor shower or fragments from a comet that passed the earth’s orbit at the time. 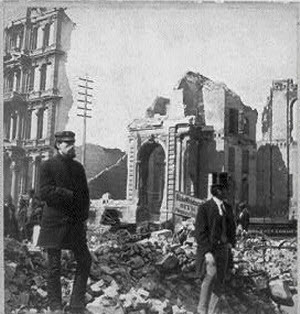 Two Men In Front of the Ruins of Chicago. The man on the right is wearing a top hat and tuxedo jacket but no pants. I am sure there is an interesting story behind this. Whatever the cause, the fire spread quickly. Most buildings were made of wood and were covered in flammable tar paper, as embers were carried by the wind and air currents generated by the growing fire, they quickly ignited neighboring buildings . Even the sidewalks helped spread the flames as they were made of wood. 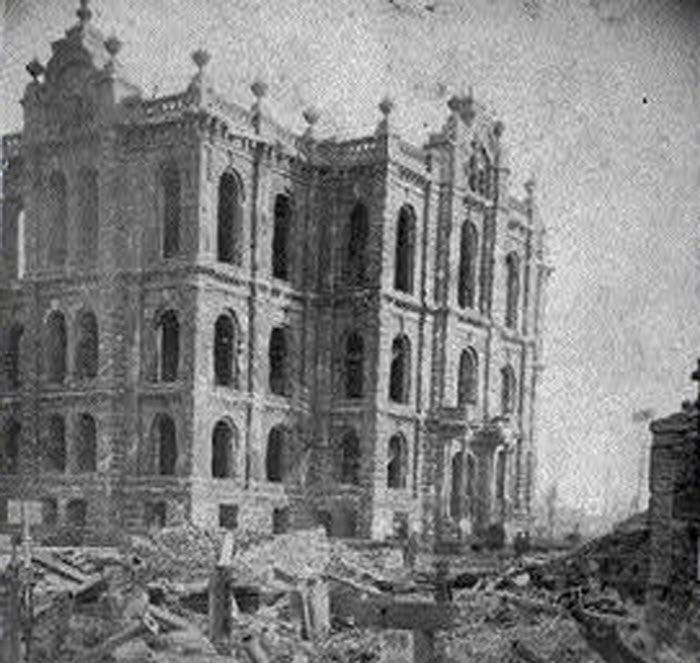 The small fire department was quickly overwhelmed and the center of one of the largest and most economically important cities in the United State was razed.